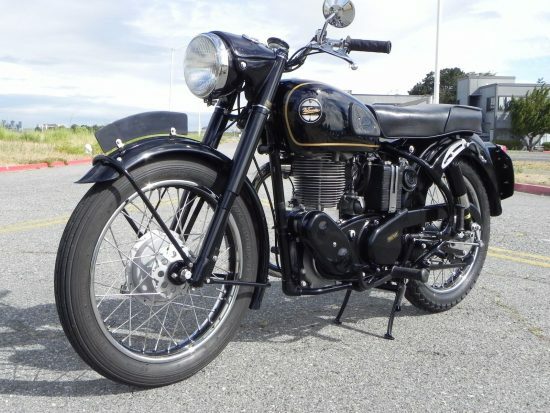 It may have been built in 1960, but this Velocette MSS is, in many ways, a very nice 1930s motorcycle. A precursor to the evocatively-named Venom, the Velocette MSS was launched in 1935, although production was interrupted by the Second World War and didn’t start up again until 1954. 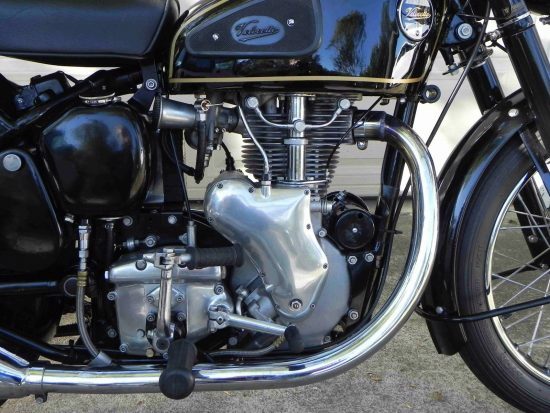 Powered by a 495cc overhead-valve, air-cooled single with undersquare bore and stroke dimensions, the bike made 23hp and had a top speed in the neighborhood of 80mph. 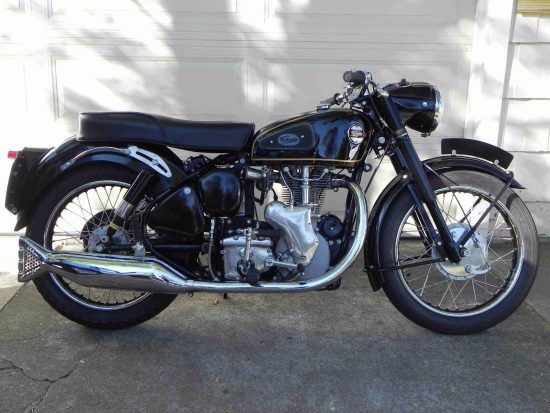 Velocette was based in Birmingham and made high-quality motorcycles that featured innovative designs, with foot-operated gearshifts and the world’s first “positive-stop” mechanism for its four-speed box. 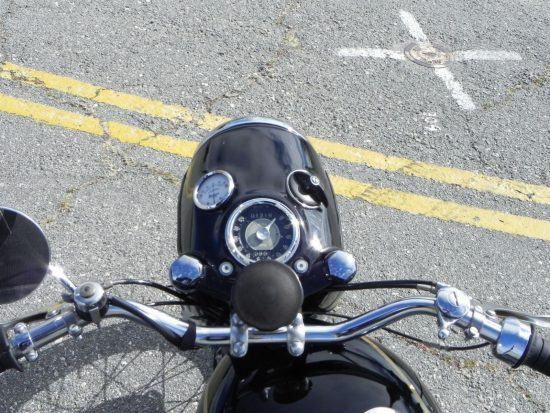 Although earlier Velocettes did use overhead-cam engines, the MSS used simple pushrods to operate the overhead valves, but that cam was situated high in the head to keep pushrods short and the bike was otherwise of very high specification. Nicely restored MSS, runs good, motor strong. Recently ridden on 125 mile BSAOCNC Gold Country Ride, in the foothills east of Sacramento. Speedometer reads faster than actual speed, may need a different speedometer drive. Some oil leaks, could be from primary case, would be nice to sort out. Not a show bike, a few nicks and chips in the paint, chrome not perfect. All in all a nice bike. All good with the electrics, headlight, taillight, horn, charging system working. Actual mileage is unknown, 1,228 currently showing on the odometer. Clear California title. Will include a copy of the owner’s handbook, good info on starting procedure. 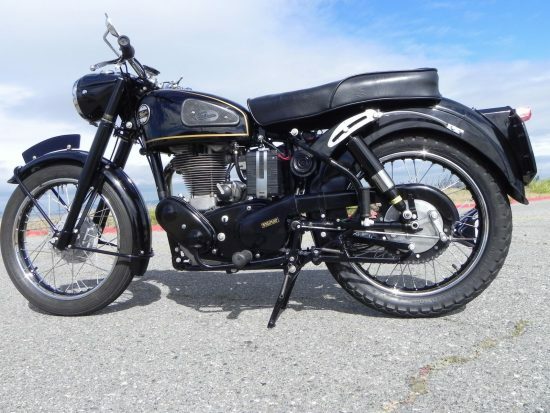 The seller also includes a short video of the bike running. There hasn’t been much activity on this auction, but bidding is up to $7,600 with very little time left. Compared to modern machines, the power is very modest, but the spread of torque is broad and these are both comfortable and very durable motorcycles, with excellent handling and there is room for performance improvement: you could probably fit some parts from the Venom if you want more speed with the subtle, stock looks.